CSIL research report Africa Furniture Outlook offers an overview of the African furniture industry with statistical data (production, consumption, imports and exports of furniture for 2017) and 2019 - 2020 furniture market forecasts for 54 countries. Furniture consumption in Africa: 2017 apparent consumption and market prospects up to 2020, by country and by geographical area (North Africa, West Africa, Central Africa, East Africa and Southern Africa). 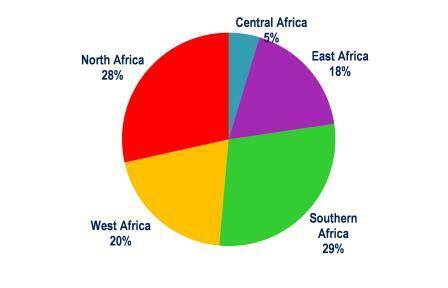 Furniture imports to Africa: by country and by geographical area (North Africa, West Africa, Central Africa, East Africa and Southern Africa), including a matrix showing the main countries of origin of furniture imports. Large urban markets in Africa (urbanisation will be very rapid, with important implications for the growth of furniture consumption). Furniture market size, furniture production and furniture trade (2017). Country rankings to place all statistics in a broad African context. Real growth of furniture consumption. Market forecasts up to 2020. Countries of origin of furniture imports. Additional socio economic indicators (Total household consumption expenditure, Total GNP at purchasing power parity, Per capita GNP at purchasing power parity, Urban population, Broadband internet connections and mobile cellular subscriptions, International tourists arrivals). A picture of opportunities for exporters of furniture to Africa. A rich collection of key country-data, allowing comparisons among countries. 2019 and 2020 forecasts on the evolution of furniture markets in the considered countries, based on the analysis of furniture industry dynamics and of macro-economic indicators. Countries covered: Algeria, Angola, Benin, Botswana, Burkina Faso, Burundi, Cabo Verde, Cameroon, Central African Republic, Chad, Comoros, Congo Dem Rep, Congo Rep, Cote d'Ivoire, Djibouti, Egypt, Equatorial Guinea, Eritrea, Eswatini (formerly Swaziland), Ethiopia, Gabon, Gambia, Ghana, Guinea, Guinea-Bissau, Kenya, Lesotho, Liberia, Libya, Madagascar, Malawi, Mali, Mauritania, Mauritius, Morocco, Mozambique, Namibia, Niger, Nigeria, Rwanda, Sao Tome and Principe, Senegal, Seychelles, Sierra Leone, Somalia, South Africa, South Sudan, Sudan, Tanzania, Togo, Tunisia, Uganda, Zambia, Zimbabwe. Furniture imports by area in Africa. Total furniture imports into Africa (both from other African countries and other areas of the world) exceeds USD 3 billion, corresponding to about 2% of world imports as estimated by CSIL. Southern Africa and North Africa are the areas with the highest level of imports among the African regions.